A study of Kepler space telescope data shows that probably all sun-like stars have planets of some kind, and that small Earth-size worlds are more common than gas giants like Jupiter. Astronomers studying data from the Kepler space telescope estimate that 17 percent of stars in the Milky Way galaxy have planets about the size of Earth. This means that about one in six stars has an Earth-size companionexoplanet. As there are about 100 billion stars in the galaxy, there are at least 17 billion Earth-size worlds in this galaxy alone. Our own star possesses two Earth-size worlds. Earth itself, and the uninhabitable planet Venus, with its thick carbon dioxide atmosphere and a surface temperature of 870 degrees F (465 degrees C). Large gas giant planets the size of Neptune or Jupiter are much less common than worlds the size of Earth. 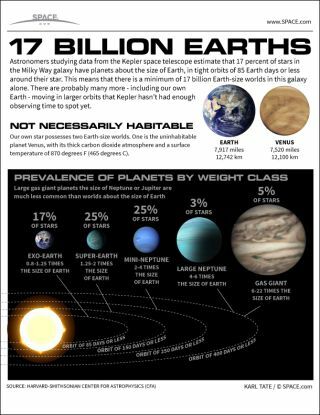 The study finds that 17 percent of all stars probably have an exo-Earth (a planet 0.8 to 1.25 times the size of Earth) in an orbit of 85 or less Earth days. About one in four stars have a super-Earth (1.25 to 2 times the size of Earth) in an orbit of 150 days or less. The same number of stars have a mini-Neptune (2 to 4 times the size of Earth in an orbit of 250 days or less. Larger planets are much rarer. Three percent of stars have a large Neptune (4 to 6 times the size of Earth) and 5 percent have a gas giant (6-22 times the size of Earth) in an orbit of 400 days or less. The research was done by the Harvard-Smithsonian Center for Astrophysics.